The Police were an English new wave band formed in London in 1977. 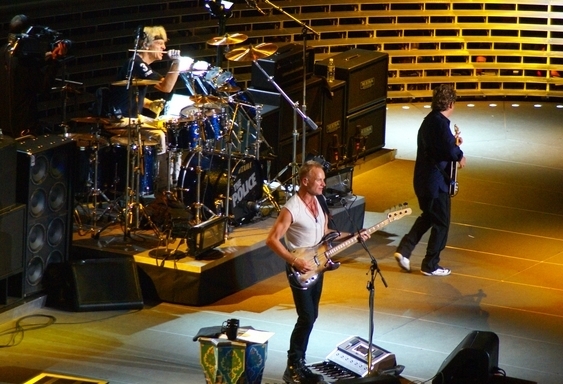 For most of their history the band consisted of Sting (lead vocals, bass guitar, primary songwriter), Andy Summers (guitar) and Stewart Copeland (drums, percussion). The Police became globally popular in the late 1970s and early 1980s and are generally regarded as one of the first new-wave groups to achieve mainstream success, playing a style of rock influenced by punk, reggae, and jazz. They are also considered one of the leaders of the Second British Invasion of the United States. They disbanded in 1986, but reunited in early 2007 for a one-off world tour that ended in August 2008. Their 1978 debut album, Outlandos d’Amour, reached No. 6 in the UK. Their second album Reggatta de Blanc became the first of five consecutive UK No. 1 albums with its lead single, "Message in a Bottle", their first UK number one. Their next two albums, Zenyatta Mondatta (1980) and Ghost in the Machine (1981), saw further critical and commercial success. Their final studio album, Synchronicity (1983), was No. 1 in both the UK and the US, selling over 8 million copies in the US alone. "Every Breath You Take" became their fifth UK number one single, and first in the US. The Police have sold over 75 million records, making them one of the world’s best-selling artists of all time. They were the world’s highest-earning musicians in 2008, thanks to their reunion tour. The band has won a number of music awards, including six Grammy Awards, two Brit Awards—winning Best British Group once, an MTV Video Music Award, and in 2003 were inducted into the Rock and Roll Hall of Fame. Four of their five studio albums appeared on Rolling Stone’s list of the 500 Greatest Albums of All Time. The Police were included among both Rolling Stone’s and VH1’s lists of the 100 Greatest Artists of All Time.